This is a quick follow up article for workout and exercise fanatics, from an article I recently wrote on why Pink Himalayan Salt is superior to Sea Salt. I wanted to write a quick something to emphasize the benefits of Pink Himalayan Salt Sole as a sports drink that has done wonders for me in my water bottle when I am working out, riding my bike on a hot day, or jogging. I think anyone who is leading an active lifestyle might want to consider putting a few drops of Pink Himalayan Salt sole into their water bottle to use while you are in the gym, or right after your workout. 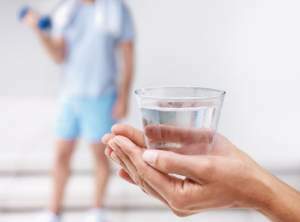 I have a 40 oz stainless steel water bottle and before I go to the gym, I fill my water bottle with water and then with an eyedropper, I add several drops of Pink Himalayan Salt Sole, which is a solution of highly concentrated salt water, made simply by dissolving Pink Himalayan Salt rocks in a glass container of water. 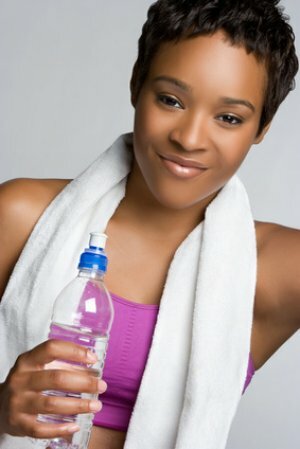 I think we all know that as we exercise and sweat, our body loses fluids, and if it gets too extreme it can lead to dehydration. Pink Himalayan salt serves to function of replenishing the body with the depleted nutrients. Whereas table salt is 97% sodium, 2% iodine, and 1% chemical toxins, Himalayan salt is more like a whole food in that it contains 84 minerals in perfect balance, in their natural state, readily processible by, and available to the body immediately after drinking. This is so interesting. It totally makes sense. I have used Himalayan pink salt, but had never heard of salt sole. Thanks for exposing me to it. It really works for me. I know that because sometimes I forget to take my eyedropper and put a little sole in my water bottle when I go workout. Regular water doesn’t replenish as much as the sole. I think joggers and cyclists can also really get good benefit from it. Is there a difference between different brands of himalayan salt? Is there anything I should search for as far as quality? I have some friends who order online from saltworks. I have also found it very inexpensively from amazon and Green Polka Dot Box. I don’t think there is a difference. I order bulk from the Salt Works as well, but I will get a $2 bottle of crystal in a salt grinder from Trader Joe’s. I do remember running across the fact that the more pink the salt is, the less minerals in it. It’s the oppopsie of what we would assume. Although personally I don’t pat attention to color because my Trader Joe’s salt is pretty pink. Just a quick note……everything I've read lately, says not to use steel with the sole. Just wood, glass or bpa free plastic. I've only been taking the sole every morning for the past 2 days, so has my father, and we've both already noticed quite a difference in how we feel, and our digestion system has also kicked up a few notches. 🙂 Feeling so much healthier already in such a short time. He has diabetes now for 20+ years, so looking to see how much difference this makes. I've already through other various methods have reduced his blood sugar so much, he hardly takes any insulin anymore, and no more bp, cholesterol or metformin drugs. And that's only after a month of what I've been giving him of other supplements. Sole, seems to be an additional supplement in the right direction. Very interesting comments. I’m glad for comments like these because I think people writing about their personal experiences means a lot to people trying to wade through all this info on the web. I can’t do without my Sole, like on a hot day or when I work out. So far as the stainless steel, hey, I’m still learning too, and I always look into any info people write in to say. Mainly because my favorite water bottle is stainless steel. If you could email me the answer to this question I would really appreciate it! My question is: when you make your sole, do you get crystal build up on the exterior of the glass jar it’s in, because I do, is that normal? I can find a lot of information about sole, but not a single mention of that phenomenon. Thank you? Are you talking about around the rim of the container? If so, then that happens for me, I assumed because there always moisture when I pour and when it dries up there is residual mineral buildup that stays there and accumulates, after the water dries. Let me know if that is or is not what you are asking about. The fundamental cases about Himalayan pink salt address the different ways it is beneficial for you because of its predominant mineral substance when contrasted with ocean or table salt.